The first time I went to Greece I had visions of myself eating Greek salad every day, hummus and LOTS of pita bread…oh bowls full of Chobani. Turns out the Greek salad in Greece actually contains no lettuce, hummus isn’t served at every restaurant and Chobani doesn’t exist. After this discovery though I came to really appreciate Mediterranean cuisine– simple flavors, fresh ingredients, and super healthy (except for those gyros stuffed with fries and dripping with tzatzki sauce at 4 am). Below is a photo of me eating one in broad daylight. Attractive, I know. In a medium pan, bring the water to a boil. Add tomatoes and red-pepper flakes; top with fish, and season generously with salt and pepper. Cover, and cook 3 minutes. Add arugula. Cover, and cook another 2 minutes. Transfer tilapia and vegetables to a plate (reserve pan). Make sauce: Off burner, add butter, lemon juice and a splash of white wine. Swirl until butter has melted. Season sauce with salt and pepper. 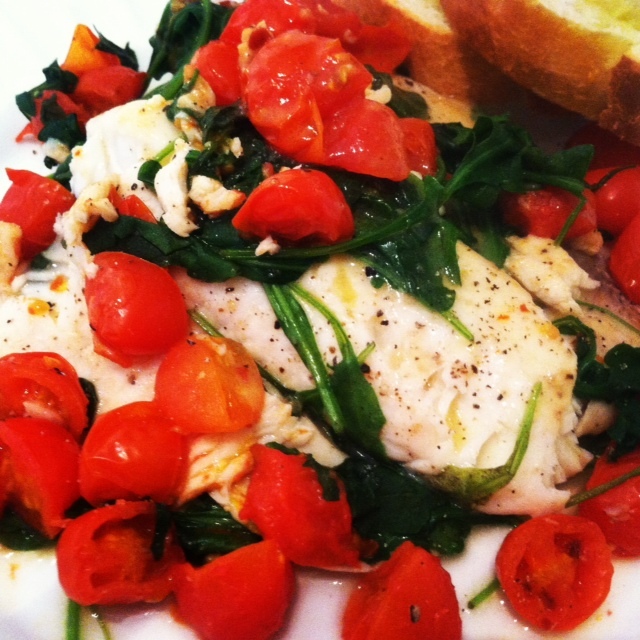 Serve tilapia over arugula and tomatoes; drizzle with sauce.